How does anyone go about meeting impossible expectations for an iconic mythos with an insanely passionate fan base? Hollywood may be in the business of delivering fantasy on a scale that defies imagination, from talking animals to snakes on a plane, but even movie magic has its limits. That brings me to “Star Wars: The Last Jedi,” by far, the most anticipated movie of 2017. It’s predecessor, “Star Wars: the Force Awakens,” kick-started a new trilogy on the foundation of the first one. Granted, it did so in a way that was very safe, very measured, and extremely low-risk. However, by all accounts, it worked. With “Star Wars: The Last Jedi,” that approach just isn’t viable. The story set up in “Star Wars: the Force Awakens,” as well as the inherent differences in the characters involved, requires that there be at least some degree of novelty in this movie. The key is not pushing it beyond the point where it loses the magic that makes “Star Wars” special. Before I try to judge just how much or how little “Star Wars: The Last Jedi” stayed on target, to so speak, there’s one point I want to make before I go any further. It’s probably the most important point for anyone assessing this movie, especially in the context of its iconic predecessors. “Star Wars: The Last Jedi” is a GOOD movie. I’m okay saying that with a straight face because by the standards of story, plot, spectacle, drama, heart, and emotional impact, this movie checks all the right boxes. It has so many powerful elements to go alongside its epic, sci-fi backdrop. There are memorable moments, iconic characters, and scenes that’ll brighten your day. While I’m willing to call this movie good, if not great, by those lofty standards, I still won’t put it in the same category as the original trilogy. I wouldn’t put it in the same category as the Jar Jar-fueled failure that was “The Phantom Menace,” either. This movie dares to be much more ambitious than “Star Wars: the Force Awakens” and that’s a good thing. Its ability to realize this ambition, however, is a very different story. The movie hits the ground running. Like “The Empire Strikes Back,” this movie puts the Resistance led by Princess Leia in the same dire position we saw the Rebel Alliance in the original trilogy. 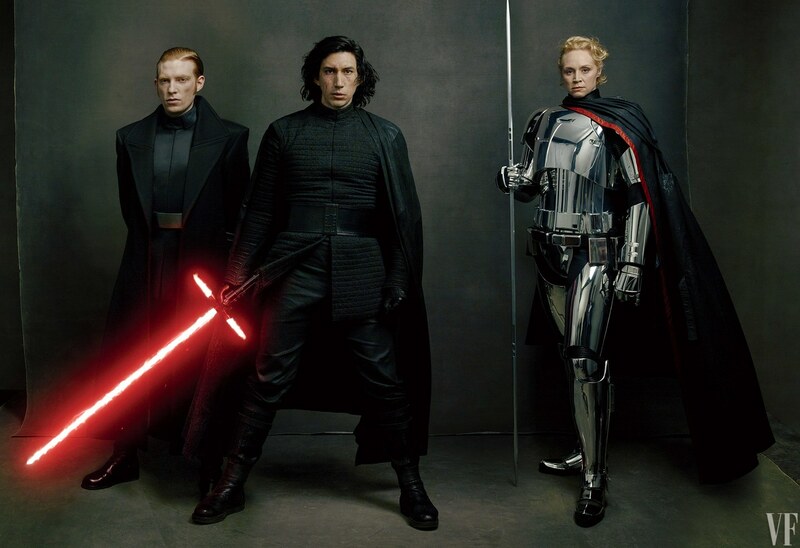 Even though they scored a major victory at the end of “Star Wars: the Force Awakens,” it didn’t stop the First Order from continuing their ascent. For much of “Star Wars: The Last Jedi,” the Resistance is on the ropes and on the brink of annihilation. Every moment counts from the moment the iconic screen crawl ends. There’s always a sense of action and tension. It makes clear from the beginning that this is the kind of movie where you’ll want to push your bladder capacity to the max. This makes the movie exciting at every turn. It’s even exhausting, at times. However, it’s definitely a strength. When there are epic space battles, secret missions, and tense moments between characters, that strength only grows in terms of scope and scale. If you like adrenaline in your movies, “Star Wars: The Last Jedi” is basically made for you. Usually, that kind of action comes at the cost of character development. Remarkably, this movie manages to avoid that. The respective stories of Rey, Finn, and Poe Dameron each continue in their own unique way. They each carry with them a great deal of importance for the overall story and they all come off as characters who are easy to root for and love. Some do far better than others. Poe Dameron definitely benefits most from having more face time in this movie. Unlike “Star Wars: the Force Awakens,” he has much more influence over the direction of the plot. He stands in stark contrast to everyone around him, from Finn to Princess Leia. If there were a Poe Dameron fan club, then this movie would be their favorite, by default. The other characters shine in their own ways, as well. Finn’s story is compelling in that it picks up where he left off. He’s still very much a reluctant participant in this conflict, much like Han Solo before him. He has his share of opportunities to run from or confront his past. His struggles in making those decisions help strengthen his character even more. With Rey, though, it’s a bit more complicated. In fact, I would go so far as to say that “Star Wars: The Last Jedi” made it much harder for her to establish herself as an icon within the “Star Wars” mythos. The mystery of where she came from, who her parents are, and why she’s so strong in the Force really fall flat. However, she still finds plenty of ways to be compelling. This brings me to parts of “Star Wars: The Last Jedi” that I think fell flat. I won’t say they didn’t work completely, if only because nobody like Jar Jar showed up. However, there are flaws in this movie that keep it from achieving the kind of iconic status of its predecessors. If this movie has a major flaw, it has to do with how it handles Kylo Ren and Supreme Leader Snoke. These two were set up in “Star Wars: the Force Awakens” to be the new version of Darth Vader and Emperor Palpatine. However, the way their story plays out is very different and not necessarily in a good way. Part of what made Darth Vader such an iconic villain was how far he fell to the dark side and how he managed to fight back, despite Emperor Palpatine’s influence. It’s clear that Kylo Ren is on a similar dark path, but there’s never an explanation as to how Supreme Leader Snoke corrupted him. There’s not even a sense of who Snoke is and why he reached out to Kylo Ren in the first place. That lack of context makes many of the events surrounding Kylo Ren seem somewhat empty. He makes clear that he’s on a dark path and he wants to pursue that path to the utmost. Rey, in her need to see the light, tries to connect with him. It helps make for some of the most dramatic moments in the entire movie. However, without a greater context, they don’t have the kind of impact that made “The Empire Strikes Back” so great. That still doesn’t stop Kylo Ren from stealing the show in his own way. Towards the end, he ends up going much further than Darth Vader or any Sith ever dared. More than anything else, “Star Wars: The Last Jedi” establishes Kylo Ren as the ultimate adversary for Rey, the Resistance, and the entire galaxy. There’s no redemption for him. There’s no chance he’ll come back to the light. Even Princess Leia acknowledged that. It’s a huge departure and a very different direction that is somewhat new to the “Star Wars” mythos. Some fans may see that as a bad thing. Others may see it as a good thing. Personally, I think it’s good because it clearly sets this trilogy apart from the others. It makes clear that this trilogy is not going to follow the same patterns as the others. That’s exciting in some ways, but jarring in others. Overall, I consider that approach a net positive for “Star Wars: The Last Jedi.” There are a few other minor flaws. Some of the newer characters, like Rose Tico, don’t really do much to endear themselves to the audience. They don’t pull a Jar Jar, though, and completely derail the story, either. There’s a lot more that could be said about the flaws “Star Wars: The Last Jedi,” but those flaws are petty in the sense that they stem from the simple truth that this movie is not “The Empire Strikes Back.” Those expecting it to be that way are setting themselves up for disappointment. Those expecting similar themes will be disappointed too. “Star Wars: The Last Jedi” doesn’t try to be “The Empire Strikes Back” and that’s a good thing. It tries to succeed in its own unique way and by most measures, it succeeds. The movie never drags. It never gets confusing or chaotic. Every story and sub-plot manages to come together in a fairly concise manner. It has polish and focus, as well as moments that are just pure fan service. Again, this movie is not going to be as iconic as “The Empire Strikes Back” and that’s worth belaboring because, if some of the fan reactions to this movie are any indication, that’s what a lot of people were hoping for. Unlike “Star Wars: the Force Awakens,” this movie took chances and dared to do something different. In terms of expanding the breadth of the “Star Wars” mythos, those chances paid off. More than anything else, though, “Star Wars: The Last Jedi” establishes the importance of maintaining hope in the face of the most dire situations. So much of this movie is spent with the good guys on the brink of defeat. At times, it seems as though they’re just delaying the inevitable. That makes the hope they inspire that much more special. That’s what makes “Star Wars: The Last Jedi” a great movie experience. It doesn’t just expand the story of an iconic mythos. It does it in a way that inspires hope. Given how fragile hope often is in the real world in the face of some pretty grim headlines, that kind of hope is more important than ever. If you’re a “Star Wars” fan in any capacity, then these are truly exciting times. It doesn’t matter if you’ve got the blueprints of the Millennium Falcon tattooed on your back or just think porgs are adorable, this is basically your Mardi Gras. Another new “Star Wars” movie is set for release and, by all accounts, “Star Wars: The Last Jedi” is set to give Disney a fresh pool of money to swim in. Now, I love “Star Wars” as much as anyone who grew up on a healthy diet of sci-fi and comic books. I’ve seen every movie in theaters. I had more than my share of “Star Wars” toys as a kid. I do intend to be in line to see “Star Wars: The Last Jedi” on opening night. Like X-men and football, I’m that passionate about the things I love. It’s because of that passion that I often find myself coming up with strange, if not eccentric, interpretations of the story. Part of that stems from my love of fan theories and my inclinations to create my own. “Star Wars” has such a rich, vibrant mythology surrounding it. Naturally, it’s going to inspire more theories than most. However, in getting my mind one with the Force in anticipation of the release of “Star Wars: The Last Jedi,” I found myself contemplating some unexpected ideas. 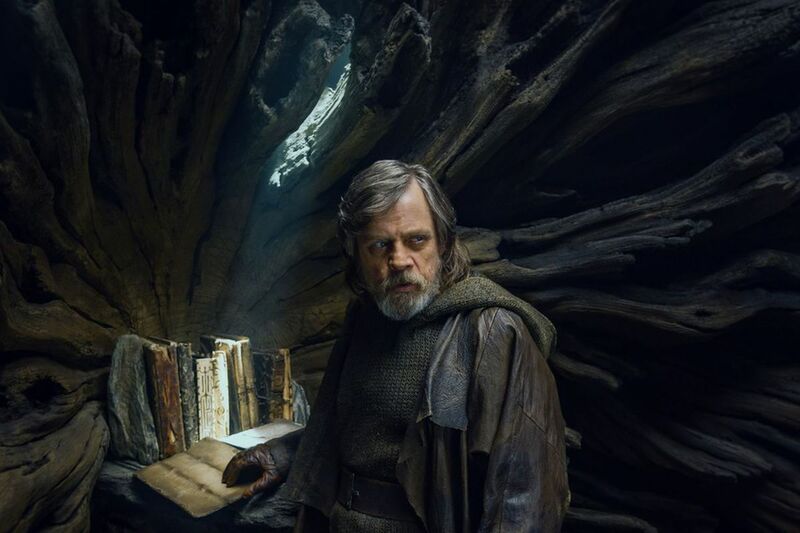 In doing so, I came to a realization that isn’t so much a fan theory as it is an observation, and one that will probably incur the wrath of every adherent of the Jedi Order, which is a thing by the way. I’m willing to take that chance, though. I don’t know whether the Force will be on my side after this, but in the name of digging deeper into the “Star Wars” mythos, I want to put this out there. If you’re prone to Sith-level outrage, you might want to put up your deflector shields because I’m about to make a statement that strikes at the very heart of what it means to be a Jedi. That statement is this. Dr. Doom is the perfect embodiment of the Jedi. I’ll give “Star Wars” a moment to stop seething and Marvel fans a moment to stop laughing. Take all the time you need. I know this sounds like something a man only comes up with after he’s had a few too many glasses of whiskey while re-watching “The Empire Strikes Back” one too many times. Make no mistake. I’m dead serious about this. 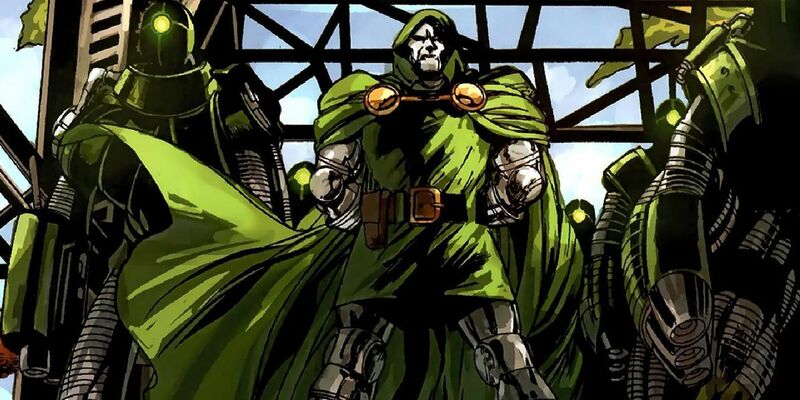 By every measure, Victor Von Doom, the same character who is regularly regarded as the greatest villain of all time, represents the values of the Jedi Order better than any other character. Given Doom’s villainous nature, which I’ve discussed before, that sounds like the equivalent of claiming that Jar Jar Binks was a Sith Lord. Actually, that might be a bad example. However, I do believe there is an argument to be made here and not just because the designs for Darth Vader might have been inspired by Dr. Doom. To understand this argument, we must first understand the core tenants of the Jedi Order. According to the official Star Wars wiki, the Jedi Code is built around these principles. Anyone who has watched at least two “Star Wars” movies can probably see plenty of examples of these tenants. In every movie, in some form or another, the Jedi espouse principles of non-attachment, harmony, knowledge, and an overall understanding that death is neither the end, nor the beginning. Those who have studied philosophy and theology in any capacity will probably recognize that these concepts are very similar to major principles of Taoist philosophy. In fact, the whole Sith/Jedi dichotomy nicely reflects that of Yin and Yang, which is probably the most well-known Taoist principle. While those tenants may sound like something Dr. Doom embraces, a closer examination of how Doom conducts himself reveals something else. You don’t even have to dig too deep to see just how much Doom embodies the ways of the Jedi. One of the most distinct differences between a Sith and a Jedi is how they approach passion. Sith, as Anakin Skywalker so nicely demonstrated in “Star Wars: Revenge of the Sith,” are fueled by their passions. Their anger and hate fuels them. Jedi see those emotions as temptations that send Force-wielders down a dark, selfish path. Anakin’s descent into the dark side nicely documents that fall. However, while Dr. Doom can become annoyed and frustrated, he rarely demonstrates Sith-level anger. In fact, most of the time, Doom’s emotional state is one of cold, callousness. When he donned his famous, obscenely overpowered armor, he did so with the intent of shedding the passions that he believed had held him back. As a result, Dr. Doom is largely devoid of the kinds of passion that would make him a Sith. If anything, that lack of emotion, along with the immense intelligence that makes him one of the smartest minds in the Marvel universe, grants him two of the key Jedi tenants by default. 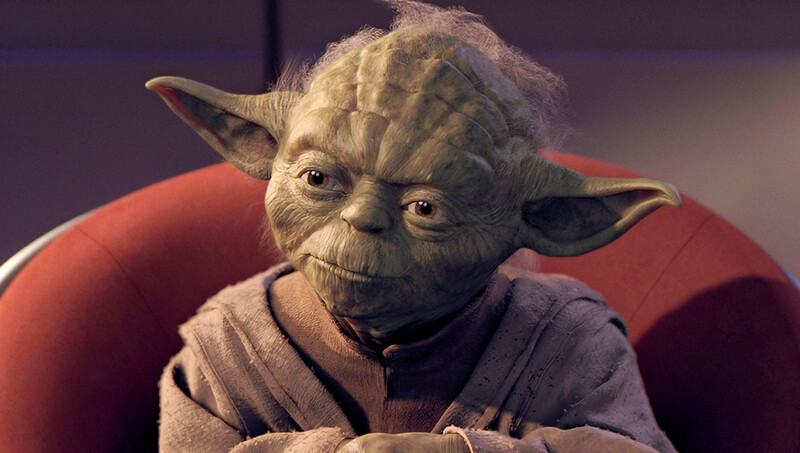 The Jedi Code also focuses on tempering chaos, promoting harmony, and achieving serenity. In a sense, these are all perfectly in line with Dr. Doom’s goals. Stan Lee himself, the guy who co-created Dr. Doom, went so far as to say that Doom isn’t a villain in that he seeks to rule the world because he believes he can do a better job. In a sense, Doom sees the same thing the Jedi sees. The world around him is full of chaos. People, in general, are consumed with chaos. Nothing but destruction will come from that chaos and they both seek to temper it. The only difference is that Doom does more than just attack it with a light sabre. 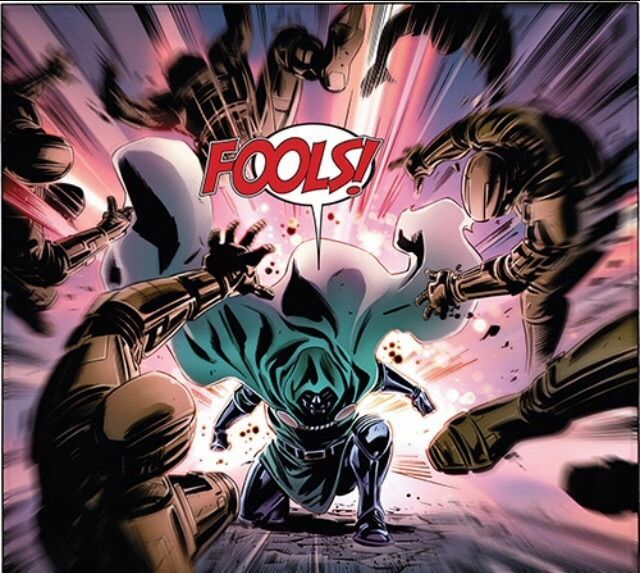 Dr. Doom’s desire for order are even reflected in the crossover event, Doomwar. It’s in that event that Dr. Doom learns from Bast, the Panther God, that the only future in which mankind is free from suffering, want, and chaos is one where he rules. In a sense, Doom see’s ruling the world as his destiny. Given how often the Jedi and the Sith make a big deal about destiny, Dr. Doom fits right in with those principles. Even in matters of life and death, Dr. Doom aligns himself with the Jedi, albeit in more overt ways. For him, death is hardly a barrier. Whereas Sith fear and dread death, as Anakin Skywalker did in trying to prevent the death of his loved ones, Dr. Doom basically brushes it off. He doesn’t just cheat death with his army of Doombots. He has actually become a god on more than one occasion. Whereas a Sith like Anakin will lament the loss of his mother and wife, Dr. Doom will sacrifice the woman he loves to a demon without batting an eye. Like the Jedi, he does not care for personal attachments or petty passions that might hold him back. He sees himself as too smart and too capable for such things. It’s not that he sees himself as a god among men. He’s just smart and powerful enough to prove it. In a sense, Dr. Doom is the ultimate endgame for a Jedi. He is the ultimate extreme of what happens when you take the Jedi Code and push it beyond the limits of frail human minds. It leads someone to becoming numb to their passions, empowered by knowledge, and driven to forge harmony out of chaos. With that in mind, I want to acknowledge that there are other intricacies to the Jedi Code with which Dr. Doom is inherently incompatible. Unlike Doom, Jedi don’t seek to rule whereas Sith Lords do. Also unlike the Jedi, Dr. Doom can be pretty damn selfish and arrogant, which are hardly in line with the selflessness championed by the Jedi. However, when evaluating the code of the Jedi and the Sith, Dr. Doom still checks more boxes with the Jedi. Her certainly wouldn’t get along with the likes of Yoda, Mace Windu, or anyone on the Jedi Council, for that matter. Then again, Dr. Doom doesn’t get along with anyone and that’s kind of on purpose with him. He doesn’t care whether or not anyone gets along with him. He only cares that they honor his authority and superiority. Like a Jedi, he is beyond petty emotions or blind ignorance. His strength, knowledge, and abilities speak for themselves. He needs no passion or anger to fuel him. He just needs to be Doom. In writing this, I imagine I will upset and/or anger many “Star Wars” fans whose knowledge of the franchise is far greater than my own. There may even be a few details that effectively nullify my claim about Dr. Doom’s status as the ultimate Jedi. I welcome those discussion, provided they’re not on par with a Sith-level temper tantrum. Given the upheaval in the Jedi order so artfully promised in “Star Wars: The Last Jedi,” I just felt as though this observation was worth sharing. 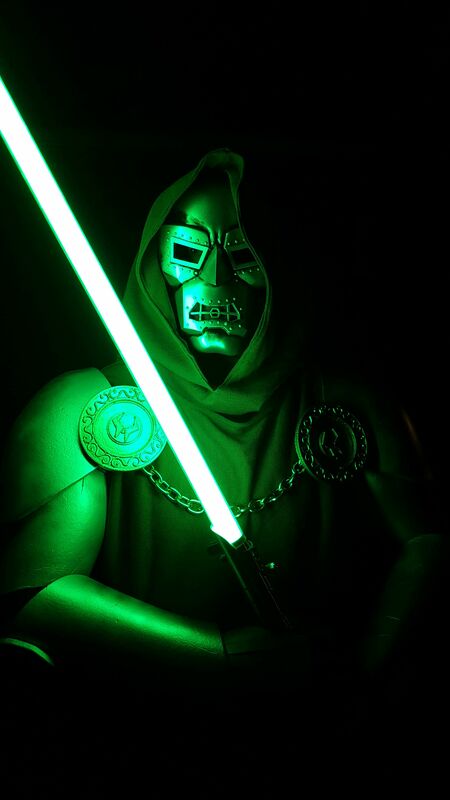 It’s impossible to know whether Dr. Doom would make for the perfect Jedi, the ultimate Sith, or something in between. It’s just interesting to see how the ideals he embodies fits into this iconic sci-fi mythos.